Every year thousands of seabirds, mainly guillemots like this one, razorbills and gannets, are washed up on beaches covered in oiled or clean but emaciated. Guillemots and Razorbills migrate through the English Channel to their breeding grounds during the winter. Juvenile birds will spend much of the winter in the channel rather than at the breeding sites. The type of oil that these birds are covered in varies from thick sticky crude oil to thin engine and heating oil. It is more common for oiled birds to be found with patches of thick black oil as spills of lighter heating oil with evaporate quite quickly. Other greasy chemicals have been found covering seabirds. It is becoming more common for emaciated seabirds to be washed ashore. By the time these casualties reached the beach they have normally become quite critical. The emaciation is normally caused by a dramatic change in the weather or from a lack of fish stocks. It is surprising how fast a Guillemot can run and if frightened will run or fly back into the sea for safety. It is not advisable to attempt capture unless you are experienced at catching birds. To catch any seabird on the beach you will need a towel or pillowcase and/or a net. Do not approach the bird from the land side, keeping wide of the bird, go down to the water line and stand between the bird and the water. This is not always possible as they may be on the edge of the tide - if this is the case wait for a while and the bird will normally move higher up the beach. Approach the bird with the towel held low covering your lower legs and feet or use a net. Guillemots and Razorbills have a habit of running between your legs if given the chance! Try not to look directly at the bird, as this will frighten it more. 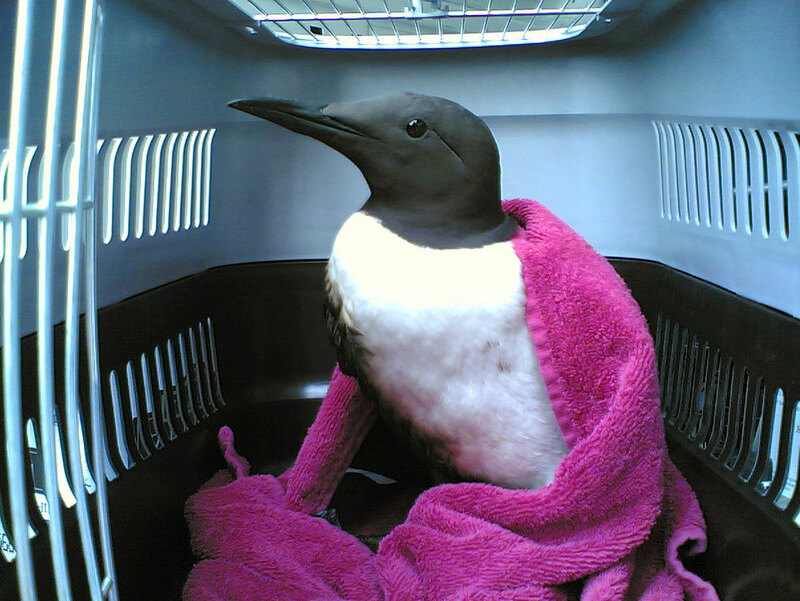 Once caught small seabirds like Guillemots and Razorbills can be wrapped in towels or pillowcases and carried back to your vehicle. They can then be placed into pet carriers but ensure there is plenty of ventilation. This is due to the fumes building up inside theses containers. It is more important that these casualties receive internal medication rather than external cleaning and washing so please do not take such a bird home and start washing it. Guillemots and Razorbills benefit from being kept with others of their kind so please do not try to look after an oiled bird yourself. Contact East Sussex WRAS or your local veterinary centre for help and advice. Birds will only be washed once they are fit enough to withstand the stress of the washing process. After this is complete these birds need to be given regular access to warm water and allowed to washed and preen themselves. This will stimulate the oil glands, which water proof their feathers. Until the birds have recovered their natural oil on their feather the birds will need drying and keeping warm. Guillemots and Razorbills need to be rehabilitated in large outdoor pens with others and in pools where they can dive and develop their strength again. Once they are heartily eating and diving for food they can be released back into the wild. When major spills have occurred these birds should be released away from any known danger.